My blog has been reasonably quiet this month. My kids are on school holidays and I’ve been writing every spare chance I get. And by writing, I really mean editing, which is the same as examining my work, deciding it is all crap, and re-writing. I’m about three-quarters of the way through the third draft. I set a goal of 60,000 words to write/edit for the month of April and signed up for #CampNanoWriMo, and with a week to go, I don’t know if I’ll make it. I’m currently at a little over 40,000 so I’m going to have to pull out some impressive numbers over the next seven days. On the plus side, I feel like the book itself is a lot more solid than it was before I began this round of edits. Once I finish them, I’ll let the book sit for a while before I print it off, read it, then go at it with a coloured pen, hopefully for the final time before I send it to beta’s of my own. I’ve also done a little reading (though not enough) and beta reading. I still have two more books for my April challenge to read through and I’m behind on my Aussie authors and eclectic readers challenges. 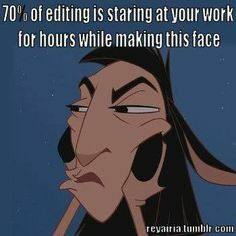 I’m hoping I will catch up once I can get through this final section of edits.